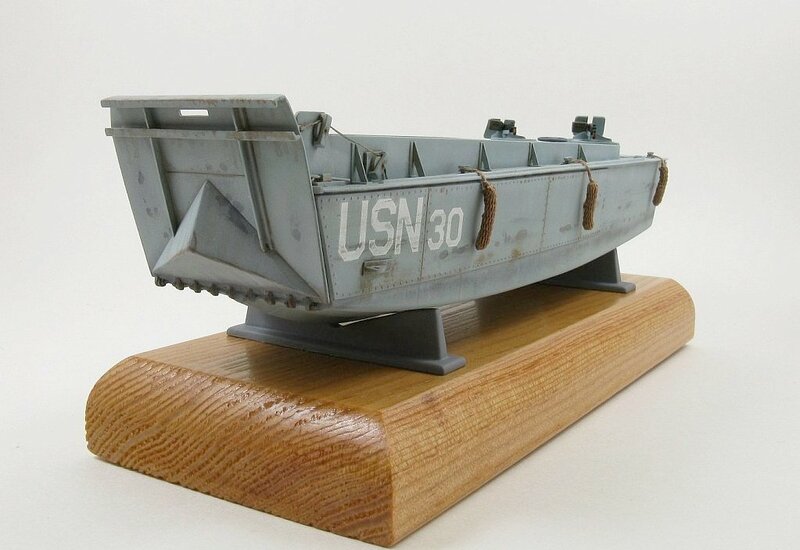 To the best of my knowledge, not many model kits include bumpers, and for those that do, the bumpers are molded or cast in the kit’s media, and are very rigid. An alternative is this set of absolutely gorgeous bumpers, woven from pre-dyed fine thread. Inside the package you get 6 bumpers and an instruction sheet. 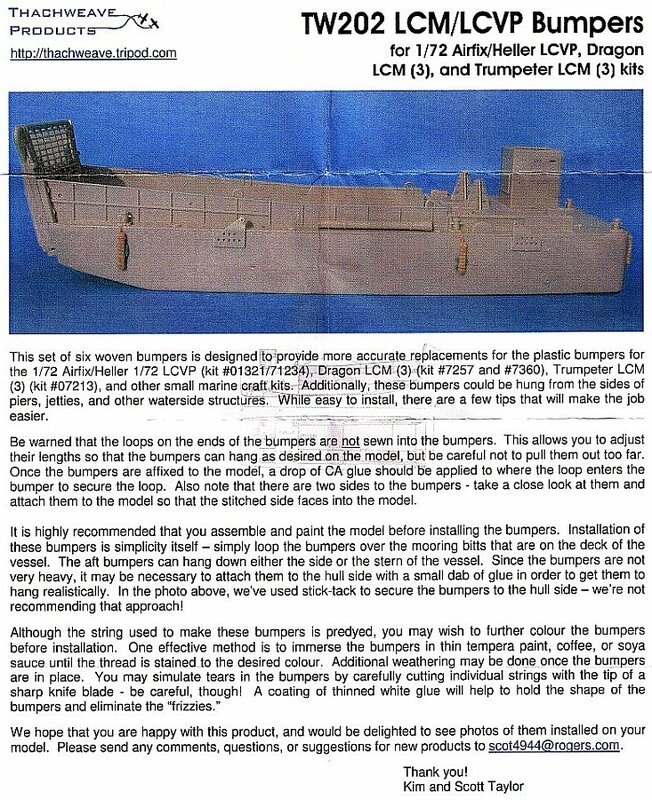 The instructions are well written and provide some suggestions on how to colour and mount the bumpers. Even though the bumpers come pre-dyed, I wanted to try and darken mine some to give them a more used look, so I tried Thachweave’s suggestion of staining them with some tea. Unfortunately, this did not work as well as expected, and I tried an alternative method - soya sauce. This too did not work as well as I wanted. I think the indifferent results were due to the dye having some sort of inherent water repellency. After some thought I decided that paint might be the best option. I made a thin wash of enamel thinner and some Testors Flat Black paint and just barely touched the end of the bumpers to the surface of the wash. The paint wicked up into the thread and once dry I had a nice darkening of the thread, running from quite dark at the bottom to next to no change near the top. At last, success! For a couple of the bumpers I darkened the ends even more by allowing paint pigments in the wash to settle a bit and then re-dipping just the end of the bumper into the darkened solution. That worked quite well also. Now I had a set of bumpers that looked like they had spent quite some time in the water. 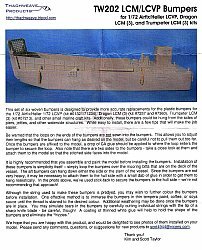 As the instructions say, the bumpers are not very heavy and don’t hang very well on their own, to which I can only agree. As an experiment I thought I might be able to push a short piece of thin guitar wire through the middle of one bumper to see if I could bend it into a slight curve and have the wire help the bumper hold its shape. I did get the wire inside the bumper, but I could not bend it due to the flex in the thread, and all I really got for my effort was a pin prick in the finger. 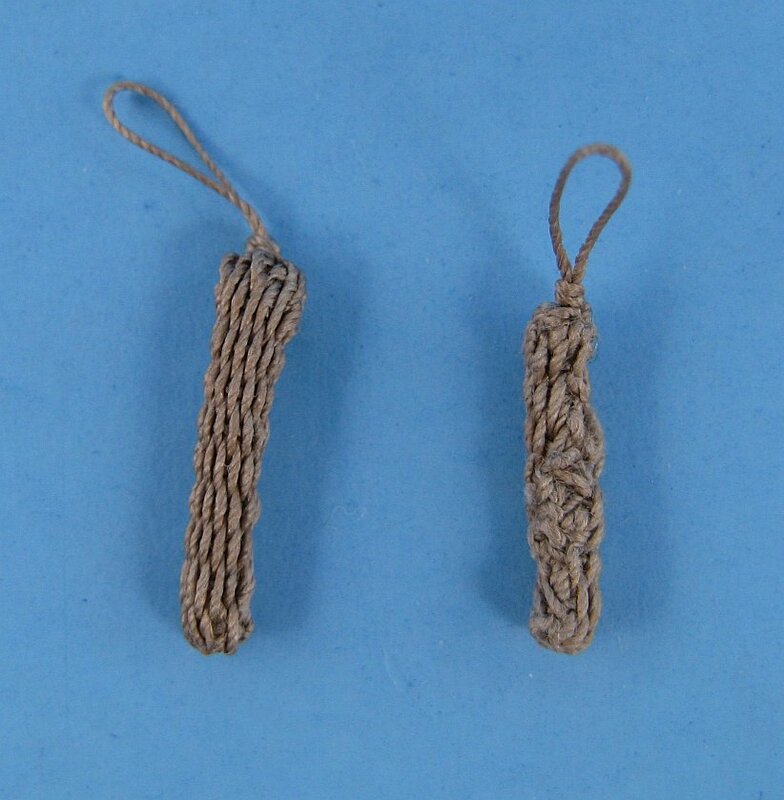 To get my set to hang better, I resorted to an old, and maybe somewhat disgusting trick, and bent the attaching threads with my fingers and applied a little bit of saliva (I can hear the YUCKs now!) 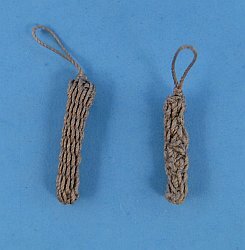 on the threads to make them hold their shape. Works for me! 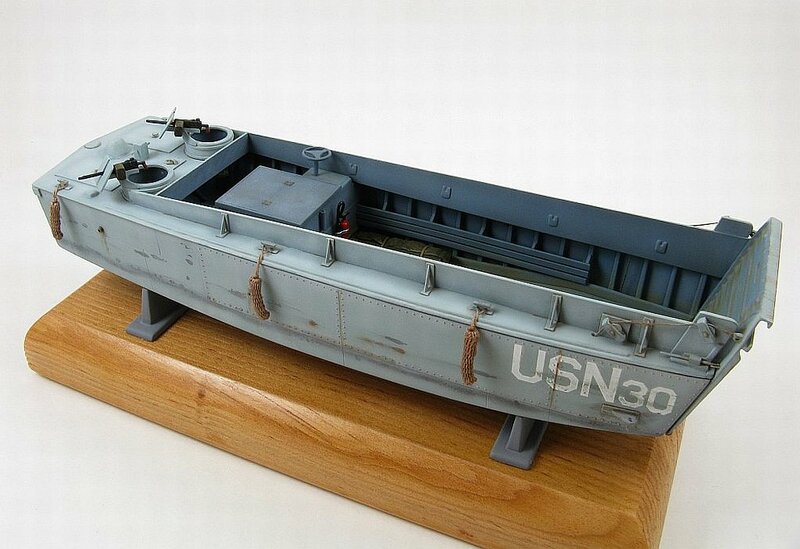 I feel that this set is perfect for any maritime subject that needs some bumpers - boats, docks, piers and so forth. I compared this set against the bumpers included in the Trumpeter LCM(3) kit and they are definitely a step up from those, and probably a step up from what any other kit will offer. I’ll have to admit that they are a tad expensive, but well worth it if you want or need that something extra to set your project apart. 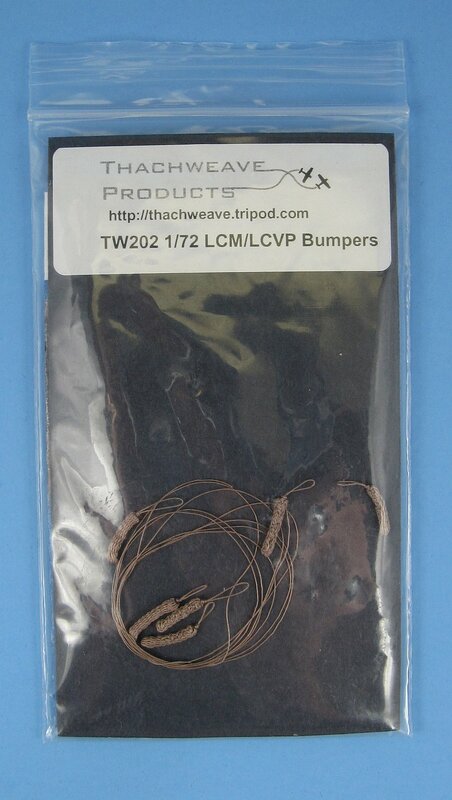 Review sample provided by Scott Taylor of Thachweave Products. 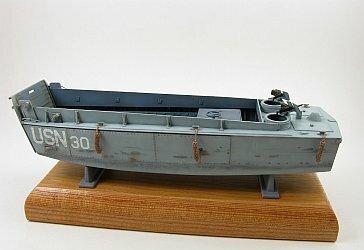 The bumper set mounted on an Airfix LCVP.